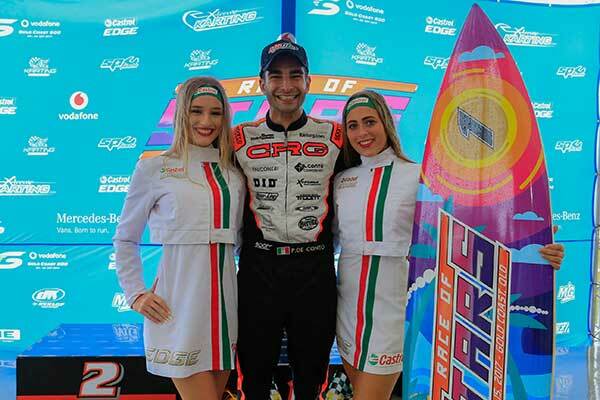 World Champion Paolo De Conto has been crowned Race of Stars Champion for the second year in succession after a challenging day on the Gold Coast. While the day was marred by the freak weather event that struck South East Queensland on Sunday afternoon, it was the Italian who claimed the winner’s surfboard for 2017. De Conto was supreme during the course of the two heat races held earlier in the day, taking both of them comfortably. The third heat on Sunday morning featured two thrilling wet track inside passes at turn one on CRG team-mate Pierce Lehane and BirelART Belgian, Rick Dreezen. 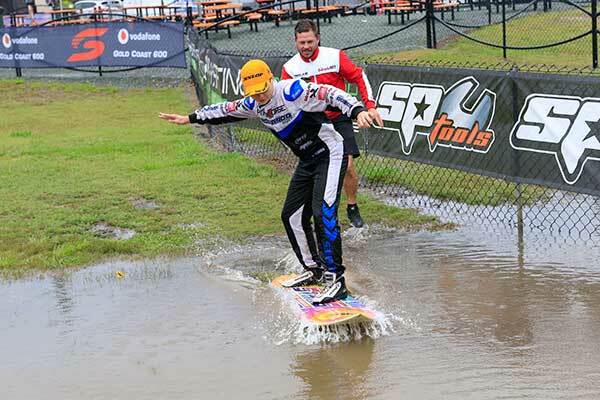 Sadly, due to the amount of water that had descended on the circuit, the KZ2 final didn’t take place, with the race meeting abandoned on the grounds of safety and standing water off the racing surface. The KA2 final was also a victim of mother nature. Lehane was awarded second place on points – which also saw him claim the Jim Morton Perpetual Trophy, which was presented to him by Jim’s wife Janelle and daughters Jessica and Nadine after the race meeting. Fittingly, Morton, who passed away in 2014, provided advice to Lehane early in his karting career and had a long relationship with the CRG Australia pilot’s father and grandfather. The trophy is supported by Castrol EDGE – who were behind Morton’s Tony Kart Australia team for many years. Rick Dreezen was awarded third placing after what has been a sensational first visit to Australia for the Patrizicorse pilot. Gold Coaster, Lochie Hughes took home his first surfboard trophy in KA2. 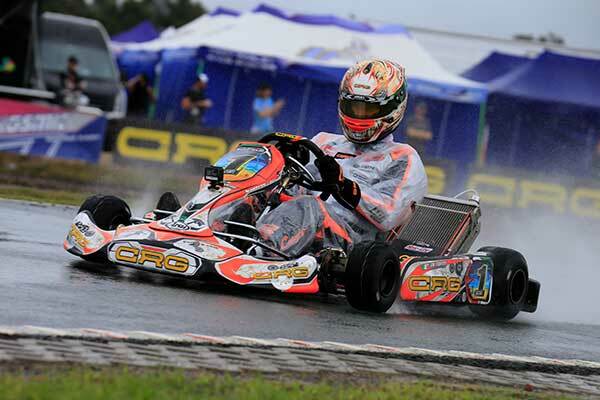 Like KZ2, the final couldn’t take place due to the inclement conditions, so the Ricciardo Kart driver took the points win. New South Welshman Cody Burcher claimed second, fitting after his heat race win on Saturday and Harrison Hoey had a successful debut with JC Kart claiming third. Hughes also tasted success in KA3 Junior, finishing second. Hughes was upstaged by Hoey though – who put in one of the finest drives of his career to win the final. The Queenslander spent little time in getting to the lead and then pulled away from the field. He dominated the pace, taking the win by more than one-second from Hughes with Jackson Souslin-Harlow taking third place for Troy Hunt’s Top Gun Academy. In KA3 Senior, five time Australian Champion James Sera showed precisely why he is still considered one of Australia’s best kart racers. The Victorian, who is the proprietor of Melbourne Kart Centre, never looked like being headed, ultimately taking the win aboard his FA Kart by nearly 10 seconds. Second place went to a prodigy of Sera’s – Victorian Christian Pancione. In his first Senior class race, the 15-year-old had to withstand a multi-kart challenge to bring his VCM Performance-backed machine home in the runner up position. Newcastle’s Thomas Davies from Newcastle hung tough to bring his PIRTEK-backed machine home in third, outlasting a challenge that involved Kody Garland, Oscar Priest and Tommy Harradine. It was Davies’ third podium finish at the prestigious event. Zac Crichton – who won the first round of the Australian Kart Championship at Newcastle – took a win in KA4 Junior aboard his JC Kart. He was involved in a race long battle with Declan Matthews and indeed Matthews crossed the line first, however was struck with a post-race penalty which dropped him to fifth. 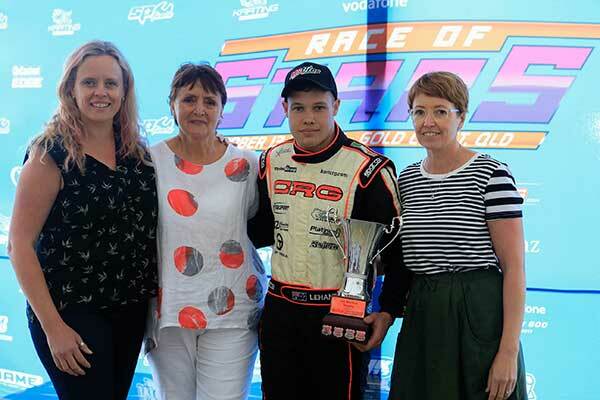 South Australian Blake Purdie was awarded second – a just reward after a solid season in the Nippy’s Fruit Juices Corsa Kart, whilst Queenslander Ryan Newton was a welcome new face to the podium at national level finishing third. Aussie TaG 125 Champion, Brendan Nelson put in one of the drives of the day in his Final. 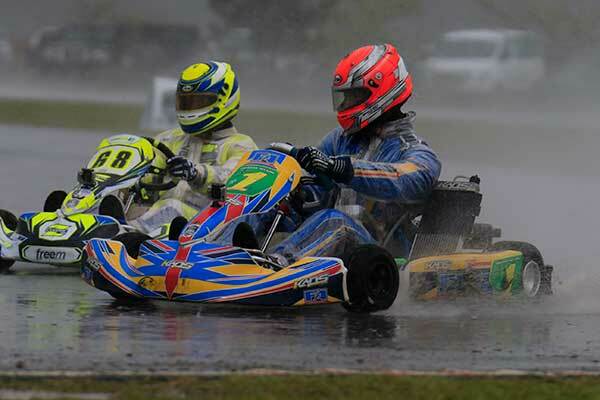 He and fellow Queenslander Kris Walton had a race long battle brewing in terrible weather conditions. Their race took place when the weather was at its absolute worst. The pair were a number of seconds in front of the field as they battled it out, Nelson getting into the lead around halfway through the laps completed. The race was declared due to the inclement weather on the 11th lap, officials going back to the previously completed lap for the final result. Emerging star, Flynn Jackes, fresh from the World Championships in England drove extremely well to bring his Kosmic kart home in third, withstanding a challenge from karting veteran, Kel Treseder and an off-track excursion to secure the podium position. 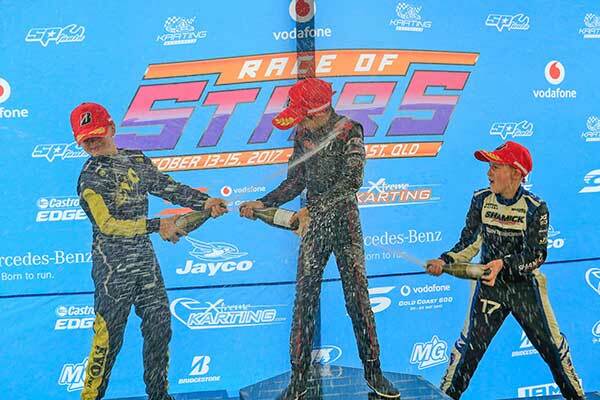 The youngest category on show at the Race of Stars, Cadet 12 (drivers between nine and 12 years of age) showed maturity beyond their years in surviving the conditions they were faced. A battle at the front between Brisbane racer Marcos Flack and Sydney EVO Kart driver, Adrian Haak went for the entire race. Haak had the early advantage before Flack took control – and both were adept in negotiating the conditions and lapped traffic to last the full race distance. They finished in front of Shamick Racing-backed Victorian, Hugo Simpson. Thus brings to an end what has been a thrilling fifth annual Race of Stars. The high quality display of driving from the European drivers continues to stun casual and experienced onlookers alike. With new names and new stars making the trip Down Under, it continues to spread the word about the event and the quality of Australian karting, with all visitors complementary on the quality of the Australian teams and drivers. This year’s event attracted a record international entry number, a record overall entry number, eight nations represented, and close race finishes – a majority of which in dry conditions were separated by less than 0.5 seconds.